In a race that started with a massive crash and an untimely yellow, Flying Lizard Motorsport was still able to battle back from last place to second place on the podium and increase their championship standings. An unfortunate yellow flag caught the Lizards as they were headed into the pits and pushed them to the back of the field. Bermeister took over driving duties for the last hour of the race with a 16 second deficit on the winning Corvette. It provded to great a time difference to make up without risking the car and their second place finish. By getting on podium Flying Lizard now sits in third for the Team and Driver's Championships and moved ahead of BMW to second place in the Manufacturer's Championship. For full details and race results, see the press release after the pictures. Joerg Bergmeister (Germany) and Patrick Long (USA) avoided a first lap accident that blocked the entire track, and then dropped to last place when the yellow flag fell at the wrong time to score a fine second place finish in the Flying Lizard Motorsports Porsche 911 GT3 RSR at the Virginia International Raceway 240 today. The other Flying Lizard Porsche, driven by Marco Holzer (Germany) and Seth Neiman (USA), also had a fine run, with Holzer setting fastest lap during his first stint and running second in GT, and then climbing back after the final pit stop from eighth place to finish fifth. The Team Falken Tire Porsche, with Wolf Henzler (Germany) and Bryan Sellers (USA) at the controls, had a disappointing day, finishing seventh, while the Paul Miller Racing Porsche, with Bryce Miller (USA) and Sascha Maassen (Germany) driving, was tenth after early pit stops with tire troubles. In the ALMS GTC class for matched Porsche 911 GT3 Cup racers, Alex Job Racing and driver Cooper MacNeil clinched the season championship in their AJR WeatherTech Porsche. MacNeil and co-driver Leh Keen had a bonus when the rival JDX Porsche had to come in for fuel with ten minutes to go. Bergmeister, who got in the car for the last hour with a 16-second deficit to the winning Corvette, could not make up any time without risking the car, so had to settle for a hard-fought second place. “We were a little unlucky with the timing of our first pit stop as the flag came our as we were headed into the pits, and that pushed us to the back of the field. I gained two positions at the start by going through the gravel because I saw the track was blocked. I think that if we had been able to have our first pit stop timed with the yellow flag, we might have been closer at the end. But Petit Le Mans is always a highlight for the year, and we can finish second overall for the season if we win there,” said Bergmeister. Long was also philosophical about the second-place finish, noting that Porsche had now passed BMW for second place in the manufacturers points (141-138). “It was a challenge today from the beginning, so second place feels pretty good. We had a perfect race after the ill-timed yellow flag, fighting back from 12th to second. To come back from everything the way the season started to have a chance to finish second for the year – and having Porsche finish second - is a great accomplishment, and we can do that with a win at Petit,” said Long. 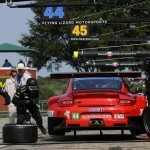 The fifth place finish for the #44 Lizard Porsche – their best of the year – was well earned with good efforts from both drivers, according to Marco Holzer. “I started sixth, and had to go wide in the gravel on the first turn and almost came to a stop, but avoided the accident and then started moving up. I took second place and had the fastest GT lap time for part of the stint. The car was great, and the first stint was fun. Seth did a great job in his stint, maintaining position and handling traffic well, and I got back in with a little more than an hour to go, and we moved pass several cars to finish fifth. The car was good all day, and the Lizards crew had great stops. Fifth place feels like a podium for us and the #44 crew,” said Holzer. After the high of winning in Baltimore earlier this month, the seventh place finish for the Team Falken Tire Porsche was disappointing. “It was not a perfect day for us today. We had to pit more often than others and it put us a couple laps down, and that was the reason why we couldn’t do any better. Finishing 7th is not what I was looking for today, but the crew, like always was great in pit stops; unfortunately for us it was just often. We learned something about the tires, but not testing here with the series earlier in the season set us back from the competition,” said Henzler. And 20 year-old Cooper MacNeil, who won his first ALMS season championship, couldn’t have had a better season in his first full year of professional competition. "Winning the championship feels great," MacNeil said. "I couldn't have done it without Alex Job Racing and WeatherTech. It's like the old saying, ‘it isn't over until it's over.’ My stint was crazy. You always get lots of contact around here. On the first lap going into Turn One, championship was going through my mind. I had to take to the infield to avoid all of the cars spinning and crashing on the track. After that excitement, I was able to get through that moment and turn good laps moving us up in the order and handing it over to Leh to win it. The team had great strategy and strong pit stops to help keep us out front." His co-driver, defending Rolex Grand-Am driver Leh Keen, shared in the excitement. Keen had the strategy down and was able to capitalize on the late race drama to take the team's third win of the season. "What a great day," Keen said. "Qualifying didn't go well, but I kept saying we had a good race car and that is what we had today. There was no better way to help Cooper get the championship than to win the race and clinch the big trophy today. I am proud of the Alex Job Racing team. The guys put together an awesome car and we had great strategy today. Every time we left the pits we were up at least one position, so great pit work as well. The last two laps were crazy. I knew we would be close on fuel. We got leap frogged by the 11 car during the last pit stop and we know now they short filled their tank. We were in second place and led a lot of laps today, so I was focused on the finish. Then when the 11 ducked into the pits I got reenergized and held Jeroen off for the win." Alex Job, team owner, had the WeatherTech team poised to close-out the championship today. Job has won multiple ALMS titles in the past, but none since 2004, so this was very special. "What a day," exclaimed Job. "Cooper and Leh did exactly what they had to do to win the GTC Championship today. The guys put together a car that was easy to drive, performed flawless pit stops and Cooper and Leh did the rest. It was an exciting race. It looked we were headed for a second-place finish, and then the 11 dove for pit lane with one lap to go, and Leh did the rest. We have had a great season with six podium finishes to go with three wins. Leh and Cooper raced really well all season. There were no mechanical or crash issues that we had to deal with, so that allowed us to keep the focus on car preparation and going fast. That is what wins championships. Consistency and Cooper's ability to team-up with three different co-drivers throughout the season really helped. Anthony Lazzaro and Jeroen Bleekemolen have a little piece of this championship as well." Guess Which Porsche Just Won the 2012 Esquire Sports Car of the Year?